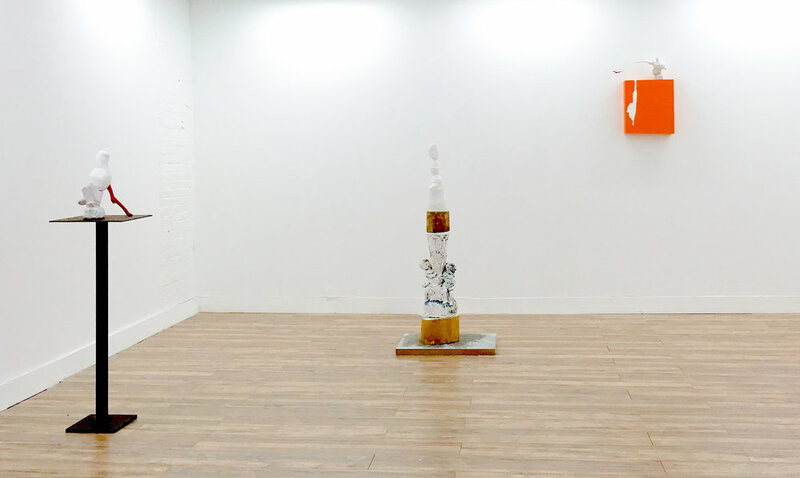 then again brings together in the physical gallery space Bell’s sculptural practice and her drawing practice. Bell’s drawings have never been included in an installation alongside her sculptural work, yet she has a deep-seated practice of working out her complex ideas around color and form on paper. The drawings included, which the artist has collectively titled Finding Form, date as far back as 2000 to the present. Bell’s drawing practice evolved and included are recent works on paper that include form that is explored over two or three combined sheets of paper. There is a palpable spontaneity and immediacy inherent in these works on paper. Also included is both wall hung and floor sculpture by Bell. The sculptural works continue in the vein of the artist’s some things series, which began in 2014. The some things share a direct affinity with the drawings as they are meditations for Bell— often initiated as mental preparation for ideas explored in her large-scale work, but a significant part of Bell’s creative practice in their own right. Also included are a handful of Bell’s latest floor pieces— a series of vertically oriented works that the artist considers as still lifes. They are stacked, delicate amalgams of many media, thoughtfully constructed and balanced. These works directly relate to the some things through use of color, physicality and relatively intimate scale. The stacked format references the human form and recalls diverse visual references such as Isamu Noguchi, Constantin Brancusi, and the iconic American skyscraper.